Bandar Seri Begawan, Brunei Darussalam: A Day Trip in the Capital of "The Most Boring Country In Southeast Asia"
A field of LED roses beside the Zaha Hadid-designed plaza in Dongdaemun. Shopping for skincare infused with snail secretion, starfish, seahorse (or whatever animal ingredient is in vogue) in Myeongdong. That earworm that both satirised and introduced to the wider world the flashy, luxury district of Gangnam. Whatever you know about Seoul, the capital of South Korea; it’s likely to be trend-led, modern, and futuristic. In fact, the highlight of my visit to Seoul in 2014 was the Dior Cafe, housed in a building that resembled an oversized tooth. But there are parts of the city that still clings on to the classics, where you can get a feel for the old soul of Seoul. I visited three such places in my previous visit, last winter. Here are my 3 Places in Seoul to See the Traditional Side of South Korea. Go, go, go! It’s no wonder that the official Tokyo city guide is called Go Tokyo. This megacity of 38 million people has a reputation of being fast, forward, and futuristic. From robot restaurants to capsule hotels (let’s not even mention Tokyo Drift), the capital of Japan is a frenetic city of skyscrapers, electric lights, and concentrated craziness. Tokyo is like the most extra of Blade Runner and Ghost In The Shell combined, with maid cafes (where doe-eyed waitresses in French maid costumes fawn over customers: “Welcome home, master!”). The future is here, and it looks like this. Having just come from Kyoto, the former imperial city and the spiritual and traditional heart of the country, Tokyo was a rapid change of pace that threw me for a loop. Even more so because I had only a full day to reacquaint myself with a city that is too fast for my tired, bootie-clad feet to keep up with. This is not a city guide, but rather my photo diary of the electricity of this insane city as well as the contrasts of its pockets of tranquility. Here are the sights I saw in my 24 Hours in Tokyo, Japan. I can think of few cities more evocative than Kyoto. It is, in fact, my favourite city in Japan. The Japanese way of life, philosophies, and customs speak to me of ritual, mystery, and spirituality. No other city in Japan is as steeped in these as the city of Emperors. Kyoto is old Japan in modern times - where the traditional arts and crafts are kept alive by generations of artisans, and where the last remaining geisha in Japan live and work in historic districts that remain practically unchanged for centuries. More than just the cultural capital of the country, Kyoto is also the spiritual heart of Japan - this is a city of temples and shrines, of torii gates and incense, of gods and spirits. Kyoto is the city to immerse yourself in the intricacies of Japanese culture - be it elaborate tea ceremonies, joyous hanami (cherry blossom viewing parties), or making offerings to fox statues at Shinto shrines. If you’re thinking of visiting Japan for the first time, I highly recommend you begin with Kyoto that you may understand the unique Japanese way of life. Either way, if Kyoto is new to you, I daresay I have you covered with my list of the Top 10 Things to See & Do in Kyoto, Japan. Porto was the perfect antidote to my short but frenetic tour of Portugal. I had shown my mother (who was visiting Portugal for the first time) Lisbon in 24 hours, trekked across the hills of Sintra in search of castles in the sky, and made a day trip to Fatima to witness the largest gathering of Catholic pilgrims in the country. A highlights reel of 3 cities in as many days; travelling by train, coach, trams had made for a hectic pace, and it came as a relief to spend a lazy day in Porto before flying back to London. That’s not to say that Porto had little to offer. Quite the contrary. From the moment the train emerged from the pitch-black tunnel to reveal a bird’s eye view of Rio Douro and her graceful arched bridges; Porto wowed me with the faded opulence of her medieval walls covered in hand-painted azulejo, the rustic charm of her hole-in-the-wall taverns, the prettiness of her pastel houses carved into hills that stopped short of the promenade, and the joie de vivre that one gets from sipping Port Wine by the riverbank from dusk till dawn. Porto, in short, was like a pop-up book of life’s greatest pleasures, laid out for the languid perusal at the tip of this lazy reader’s fingers. This is my photo diary from Porto I hope that it captures the sultry, sun-drenched, soirée I enjoyed during my last day in Portugal. Rugged and beautiful. Dramatic but tranquil. Distinctly Chinese in appearance yet with a vague Japanese influence. From surfers’ paradise on fine sandy beaches to towns built into the sides of precipitously steep mountains, the terrain and landscape of Taiwan’s North Coast is a chocolate box of different flavours, with every sight more vastly contrasting to the last. I knew that New Taipei City (formerly Taipei County) was the most populous city in Taiwan, even more so than the capital it completely surrounds; but I didn’t expect the topmost section of this municipality to hold so many breathtaking sights in such a straight line. I spent a day driving through the incredibly scenic North Coast along the blue highway, whose geographic diversity is comparable to the Great Ocean Road and a world apart from most other Asian major cities. My experience is by no means exhaustive, but rather to demonstrate how achievable it is to visit 4 of the Taiwan’s North Coast most popular destinations from Taipei in a single day. Consider this an introduction to New Taipei City. The last time we met in my Taiwan travel stories, I was showing you highlights of the world’s greatest collection of Chinese art at the National Palace Museum and the art-themed tasting menu at Silks Palace. I’ve also told you the story about how my family are connected to the founding of the country and how Taiwan, also known as Republic of China (not to be confused with their Communist cousins, the People’s Republic of China) came to be. Picking up where we left off, in today’s travel story I’d like to share with you the eight things you must see, eat, and do when in Taipei. Whether you have a personal history with Taiwan or looking to visit this young, curious country; whether you have just days to spare or have the luxury of a long trip, I daresay my recommendations encapsulate the essence of the best sights and experiences Taipei has to offer. My first impression of the gargantuan yellow and white Chinese-style building topped with green roofs was that it looked like a mountain sentinel. Rising from and sprawled out across the verdant hills of Taipei, the National Palace Museum is indeed a guardian - of the rich history of one of the world’s greatest civilisations. At a cursory glance, the Northern branch of the National Palace Museum in Taipei, Taiwan is the very image of stability, power, and longevity. However, this impressive complex belies the close call of its collection’s near-desecration and destruction at the hands of those who would have wiped out nearly ten millennia of history in the name of their so-called Cultural Revolution. The National Palace Museum in Taipei spoke to me, not only as a lover of art and history, but also as one of the greatest achievements of my great-grandfather’s party who sought to rescue and safekeep their beloved country’s legacy after it fell to the Communists. I spent a day in the National Palace Museum one of the most famous attractions of the Republic of China (Taiwan) and then an evening eating a tribute to some of its more precious artefacts at its luxury restaurant, Silks Palace. My idea of the perfect ways to take in art and history. It’s no secret that I am a huge fan of W Hotels - on Posh, Broke, & Bored alone I’ve reviewed W Amsterdam, W St Petersburg, W Hong Kong, and dipped my toes into the the pool of W Barcelona. My gravitation toward their brand of ultra-modern cool may however come as a surprise knowing that my personal taste in hotels leans towards the classic, the traditional, and the historical. So for me to happily go out of my way to stay in a hotel that is as unabashedly modern, cutting-edge and futuristic as W Hotels, what they have to offer must be truly above and beyond. 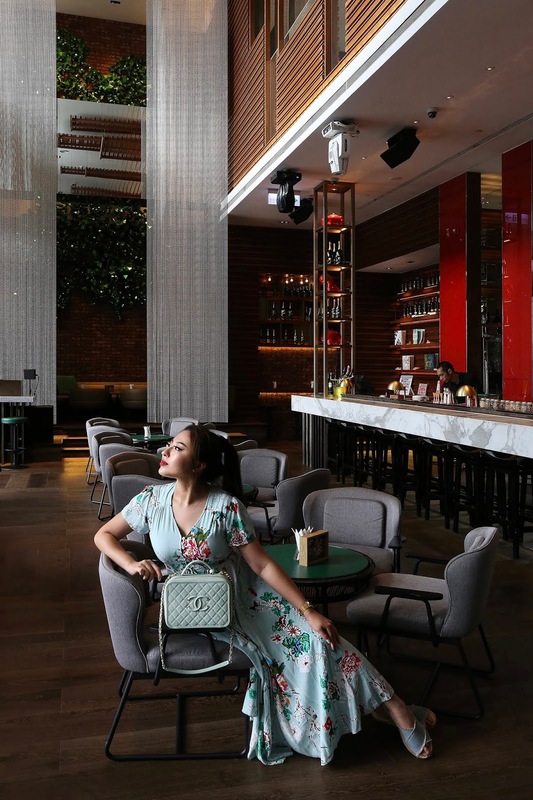 Read on to learn what distinguishes the W TAIPEI from its foreign counterparts and why this luxury hotel should be the site of your stay in Taipei, Taiwan.